My darling Ellie has been my anomaly. She stayed in utero longer than all the others. She held her breath when she was born and stayed grey longer than I liked. And she has hair when Lainy Ann did not. 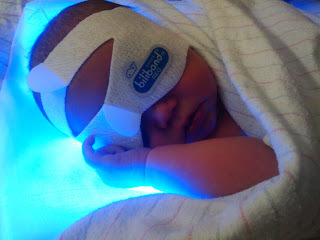 Apparently she still wants to be unique and has decided to hold onto her bilirubin. So here we are on her one-week birthday back in the hospital. Her bilirubin levels are at 19.4, dangerously high for her age. So she gets a tanning bed for the next 2 days and I get a fold out chair. On March 3, 2003 Caskey and I spent the day recovering in L&D after the birth of our first child. We loved on her and greeted the endless parade of nurses and visitors. During the lulls we would people watch out the window. Since we had a great view of the parking lot, we could see mother's waddling out of the car for their arrival and other mother's being wheeled out of the hospital with their flowers and babies. One particular mother stood out to us. She arrived after we were in the recovery room, about 15 hours later she went home. We couldn't believe it. Here I was lounging in bed with my swollen feet, avoiding walking and enjoying my hospital food. An older model red minivan drove up, they opened the side door where we could see tons and tons of car seats. They threw the baby in and zoomed down the street. We were in awe! I couldn't believe this woman was able to leave so quickly after childbirth or that she wanted to with a van-full of kids at home. Fast-forward seven years. The text books say that the more births you have had that the faster each subsequent birth is. My statistics are 6 births in 7 years. Therefore I expected baby #5 to come quickly and early. Even the OB thought that would be the case, especially with how active I am keeping up with the other 4 kids. But at 39 weeks and 2 days there were no signs of imminent labor, just a lot of pains. I had been contracting for weeks, nothing regular of course, and swelling as well. I was down to just a few outfits and flip flops because my feet had gotten so fat. Couple that with the exhausting process of arranging childcare for 4 children and the fact that the OB kept saying "this baby will be a 9-pounder", well, it was time to be done. After 3 short pushes Eleanor Marie was born at 1:50 am on November 11, 2010 (25 hours of labor total). She was just 2 oz shy of 9 lbs. My biggest baby by almost a pound. She decided to give us all a scare and held her breath for a bit and stayed nice and gray. But after a bit of old-fashioned medicine, a pounding on the back and tickling the feet she decided to breathe and turned nice and pink. I let everyone know right away that I was still planning on going home on Friday. They all gawked at me and said "we will see". They suggested a pediatrician who was more willing to make an exception to the Group B Strep 24-hour rule. I started walking first thing in the morning and eating full meals. I was bound and determined to make it home and help the older kids get ready for school; two full days in the hospital was enough for me. I think near the end the nurses were annoyed with me because every time they came into my room I reminded them of the to-do list so we could go home. Every new nurse I met was told that I was going home on Friday - even if it was at 10 pm at night. At 8:30 pm the pediatrician finally showed up. I gave her a quick family history and explained to her all the good reasons for me to go home before midnight - aside from the financial ones of course. She agreed and said Eleanor looked great and we got early discharge. I was home by 11 pm on November 12th. Eleanor wasn't even one day old yet. Caskey and I got into the car and had quite a giggle over that mom we saw through the window seven years ago. Why on earth would she go home after less than 24 hours to a house-full of noisy children?! Well, because of love, of course. There are many reasons I love Mindy; her coupon clipping, her craftiness, and her endless energy. Seven years ago I wanted to buy a giant stork and put it in our yard to announce Lainy Ann's arrival to the whole neighborhood. But Caskey was paranoid it would be an announcement to kidnappers where the prettiest baby girl was living. They would break into our home and steal her. (I have since found out that he just said that to keep me from buying the stork.) Then we had 3 boys and 3 more reasons to not put signage in our yard announcing baby's arrival; cost, time, etc. There was always a good reason to not do it. But today the whole neighborhood knows about our newest bundle of joy, Eleanor Marie. Thanks to Mindy. She snuck over to the house and decorated the front door to welcome home little Ellie. You are the best friend a mom can have. I know I am only 39 weeks pregnant, but I feel like I am over due. And with the swelling and pain . . . . well, I haven't been too enthused to leave the house. That plan isn't working so well for my 4 energetic kids, so today we went out to breakfast and then to the dollar store to let the kids pick out one of anything they wanted. That's quite a daunting task for kids. We must have spent 30 minutes just browsing and looking and deciding. Of course I ended up with a few things myself (books and writing paper for the kids). Caskey had his own stash; a new light up toy and paper coin wrappers. He told me it would be a great fun activity for the kids. I figured it would go the way of folding laundry . . . . everyone folds 4 items of clothes and then they wander off or start fighting. But since it was only a dollar, we gave it a shot. Other prized possessions included balls for Alexander (of course), planes for William (of course), a foam poster board for Lainy Ann and she convinced Connor (of course) to buy 'crystals' or glass beads. I still have no idea what the plan was, but they spent quite a bit of time conspiring and discussing it. During nap time Lainy Ann and Connor did who knows what with their treasures. They were entertained and quiet for several hours and that right there is the gift. Now that the sun has set the little kids are playing with the light up toy together. The money and time was well spent at the Dollar Store today. Less than $10 has bought me hours of (semi) quiet playtime. *sigh* I think these children of mine are too smart for me. I remember posting a few years ago about a punishment for Lainy Ann that backfired. She was so pleased that she was responsible for herself for a full 24-hours. Well, it seems Connor is following in her footsteps. Last week Connor was acting up in the car, being wild and disrespectful. We were one-block from our destination. So I stopped the car and told him he had to walk the rest of the way. I was hoping that he would realize that riding in the car is a priviledge and he needs to be respectful to me as the driver of the car. Nope. He was thrilled to death. He got out of the car and immediately ran into a friend from school. So they raced half-way down the block. I followed him the whole way in the car watching his big silly grin. The next time he got in the car he asked, "Can I walk?" *sigh* Backfire . . . . again.